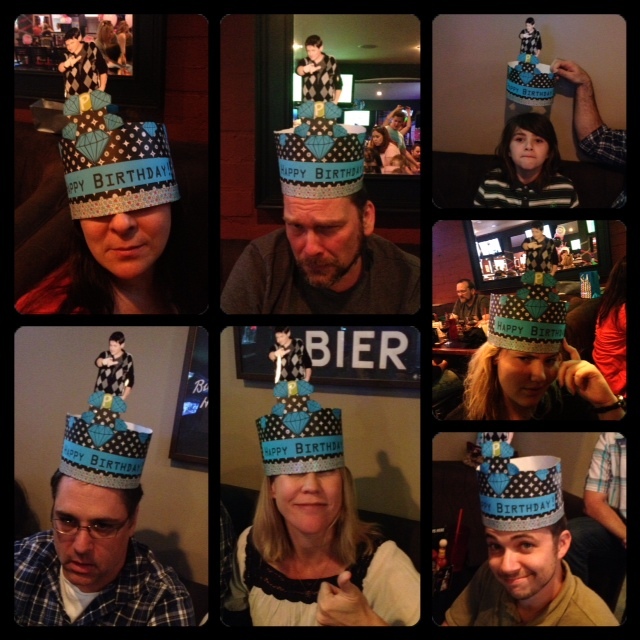 I suspect you can take one look at the picture of the birthday crown I made for my friend Paul this weekend and think, “got it … no need to tell me how to make it … pretty self-explanatory.” Alas that would make for a pretty boring “how-to” blog post. Let’s start from the beginning. 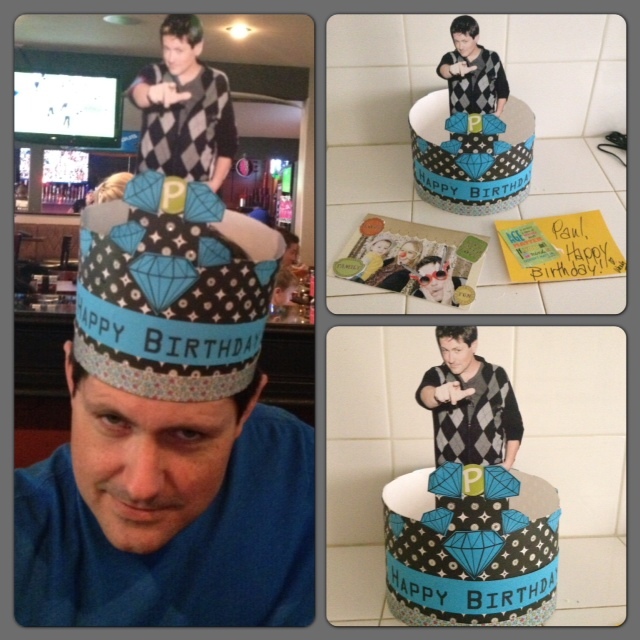 My friend Leslie sent out an invite for a surprise dinner birthday party for her husband, Paul. As a good guest I rsvp’d and put the info on my calendar. What I failed to do is read the invite itself. I’m pretty good at waiting until the last-minute to do that. During my Saturday morning walk I went through my closet in my head searching for appropriate dinner attire. I was thinking we were going to a swanky place in Hollywood so something LBD-ish would be good. I figured out a couple of options and decided I’d wear the one that was cleanest. Later in the afternoon I was laying on my bed heavy signing at having to squish into a pair of spanx in a few hours. It was then I finally decided it was time to read the invite. Turns out there was no swanky dinner in Hollywood. This was actually a family friendly dinner at a BBQ joint/sports bar in Burbank. I mentally stuffed my spanx back in the drawer and got to work. The new location offered many more options not only for my limited wardrobe but also for special birthday gifts. Since I have no money (sigh … someone find me a non-sales job … please) I decided I’d make Paul something special. 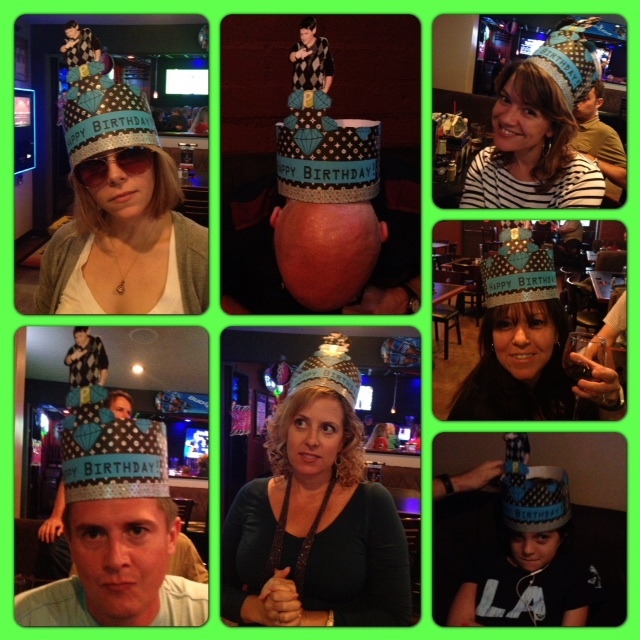 A birthday crown seemed like the obvious choice. 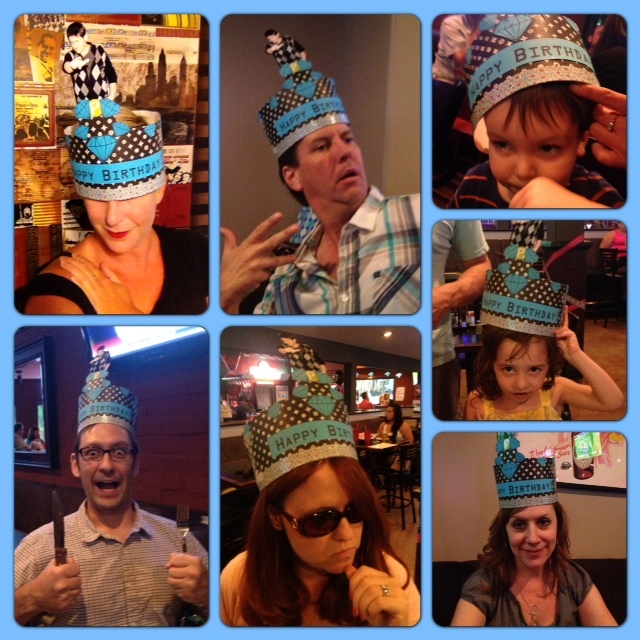 Looking at this specific royal head-gear you may be thinking, “what egotistical weirdo would want a picture of himself on his head all night?” The answer is … everyone I know. We are all pretty happy with ourselves. To be honest it’s really a shock we don’t walk around with our favorite picture of ourselves plastered to our forehead at all times. It’s just who we are. Since it was Paul’s b-day I thought he had the right to actually do just that. I took an appropriate patterned piece of scrap-booking paper. Stiff-ish kind. 12 x 12 and cut it in half. I didn’t have time to wait for glue and honestly I didn’t really trust it so I taped the two pieces together. If you plan ahead you could get some of that colored duct tape and use that. Using my head as a template I taped up the other side of the crown. I was really guessing at the correct size. I figured his head was bigger than mine so went with that. If you don’t have your subject right there to fit the crown on as you make it I suggest taking along a pair of scissors and more of your tape (scotch or fancy duct) just in case you need to make some last-minute changes. After printing out a picture of the birthday boy and gluing it to the crown I realized the entire thing was a bit too tall. Learn from my mistake and cut to the desired crown height before piecing together. I had to take scissors and cut around the top. Since I used a blade cutting thing to do other other paper cuts the top was a little uneven and not as nice as it could have been. Tip: I printed pictures straight from my subjects Facebook page. I didn’t have any faith that the quality would be any good but I was wrong. It worked well and I always figure if I use pictures that they posted then they have already approved it for public viewing! I printed out some “diamonds” and a “Happy Birthday” message on blue scrapbooking paper, cut it all out, and glued it all down (I used normal glue). Finally I had to control myself from covering the entire thing in sparkles. Since it was for a man I figured he wouldn’t be too happy as pixie dust rained down on him from the sparkly crown on his head. To give it a little more shine I took some sparkle star paper and made a small strip to decorate the bottom of the crown. TA DA! There you go. Of course you can go crazy decorating your birthday crown and I highly suggest sparkles for anyone that can handle it! If you don’t have the same type of friends I do you can always swap out the picture for a number or even a big ol’ diamond. To finish off Paul’s present I made him a magnet from a family photo (when I gave it to him the glue was dry unlike when I took the picture here). Unfortunately two of his children aren’t in the picture. I just couldn’t find one on Facebook with all of them. I suggest they sit down for a Wendy picture-taking session … STAT! Sangita – Come to Los Angeles for your birthday. I’ll make you a crown and we can go beer tasting around town!